Perhaps a trip to Weta Workshop? I remember watching the "making of" Lord of the Ring DVD featurettes and marvelling at the skills of their sculptors and artists. Of course that was 20 years ago now - I'm not sure what they do these days but it looks like they still do minatures and model making. I did the Weta Workshop tour a few weeks ago. It would be very appealing for film fans in general, but I was impressed by the enthusiasm the guide had for making stuff. It's a team of really keen people who want to encourage others. Your description rings bells with a lot of people I know at Weta. I think an anxiogenic environment is an an unrecognised and unaddressed cause of a great deal of so-called 'challenging behaviour' for autistic children and adults. It's why we needed to get Ashley Peacock out of a noisy, unpredictable, often hostile incarceration into a purpose built and peaceful supported home in the community. Good to hear. And I love the phrase anxiolytic defence system. Oh wow, all of this resonates. 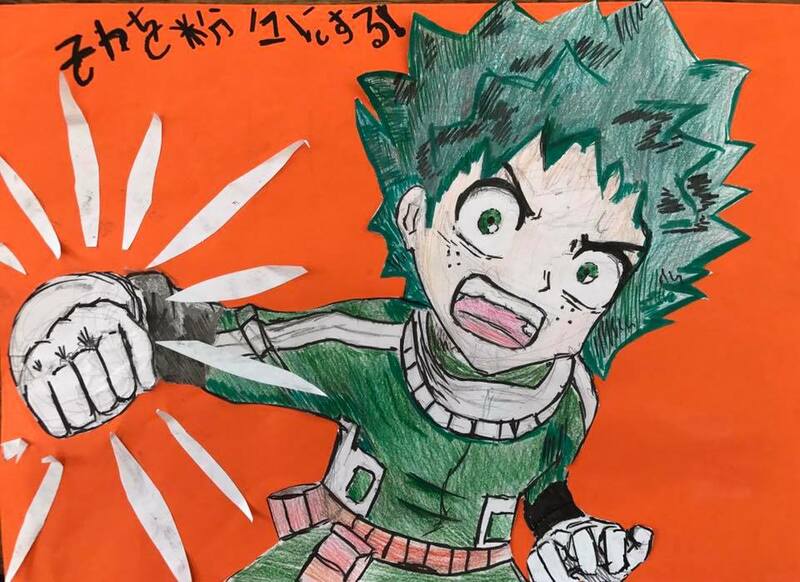 I too have a child (11 YO) with ASD and modelling and drawing (anime is her thing at present, the one here is a quick one she whipped up for the school's "superheroes" disco). My parents in Wellington were also relief caregivers for an autistic boy, and someone once gave him some modelling clay. Nekk minnut he'd produced Ali Baba and each and everyone one of the 40 thieves (all different) as intricate miniatures. Then it was the full Loony Tunes cast. He'd only ever seen them in "2D" on TV, and no one had ever taught or shown him how to sculpt. One thing lead to another, and he got some work experience at... Weta. And I love the phrase anxiolytic defence system. It just sort of came out and I thought, oh, I like that. Not every ASD person is suited to coding - this becomes more true all the time, where coding has become well integrated with a noisy, business case driven world and the lonesome pursuit of uncommon solutions is a lesser part of the job than it once was. Most ASD people love to just ‘get on with it’ without having to deal with the unpredictability of human interaction, but coding is also mathematical and logic driven and this is not to the taste of every ASD person, even if they are very mentally capable. Art and craft are definitely another good outlet for those who like a good proportion of their day to be solitary. We have to face the fact, though, that dealing with people effectively is still one of the most valued skills in the job market. I prefer their older indie stuff. but coding is also mathematical and logic driven and this is not to the taste of every ASD person, even if they are very mentally capable. Yes, this is another common mistake: every ASD person is good at maths. Leo really wasn't, although we managed to get him caught up with some tuition. On the other hand, I think Leo understands high-level game design very well – but there's no direct path to that kind of role in the gaming world. I was interested by his commentary on Black Mirror: Bandersnatch: "I've got better ideas than that in my head." BTW I introduced "A Tale in the Dessert" to a friend's ASD son a decade ago, he got to play with his Mum, it's an MMO that's quiet and low key, no shooting, no killing, gentle encouragement to get on with your neighbours, but can be happily soloed. I think it really worked well for him. I find creating 3D art and uploading it to sites like DeviantArt can be therapeutic. Even so, it'll be a hobby for me for the foreseeable future. I'll be starting dev boot camp in a matter of weeks, as demand for such skills remains in hot demand, and I have some informal web dev know-how. That said, Specialisterne NZ is still in the early stages, last time I checked, but they've been making approaches to the job market. Ooh, what software do you use? Mostly DAZ Studio, with some Sketchup and Blender on the side. Lovely stuff. Being able to make things is wonderful and I trust that Leo carries on with that. One of my family members was on the spectrum (actually more than one but another story) but since he grew up in NZ in the 40’s he just had to work out ways of working around the “noise”. I’m simplifying but I think it gets easier as people age although having some form of diagnosis helps everyone. I was thinking that the porthole he had was performing music. It was the time when he was most connected to the rest of us. Having something like that as a connector could be useful. I wondered if you had read the Steve Silberman book. “NeuroTribes: The Legacy of Autism and the Future of Neurodiversity” I have had it for a long time and almost finished it now. I found it a useful survey of the history and how we have got to a more cohesive understanding of the wonderful possibilities and people. But just wondering if you have looked at it. My perception is that there are plenty of human interactions that would benefit from a better understanding of all of this. Undiagnosed health issues are reflected often. We say we are getting better at understanding all of this but it is still delicate to talk about in a work situation for example. All the best for you and your family and yes there is still plenty of set design work in films. Perhaps less “in camera” work and more special effects but the core skills of being able to make and finish a miniature is a wonderful thing. P.S the photo is of my tiny garden. The distinctive 4 leaf thing in the middle is a sunflower which will grow to about 2.5m. Yes, this is another common mistake: every ASD person is good at maths. And yes yes plus. Getting into making assumptions about how ASD people operate isn't something I'm equiped, educational wise, well to do. kia ora Russell. If you are able to travel, taking a trip to the Tawhiti Museum in Hawera (South Taranaki) might be helpful. Created in an old dairy factory, it features a myriad of intricate, miniatures of local history (well, versions of Pakeha and Maori history), all hand-crafted and painted. There are also larger-scale reconstructions of domestic and work life across a range of interesting buildings—I particularly appreciated the building dedicated to Ronald Hugh Morrieson, having spent my growing up years in Hawera. There is one particular building which reconstructs the model-making process and they have more recently been working in collaboration with Weta. $15 admission. We visited there yesterday, after biking from Opunake with a friend (a bit of a tale, with my bike draining its battery a few km short of the town, after two hours of biking into a stiff nor’wester). Went there primarily to interview my 86 year old uncle, who is still a practicing dentist (and a bit of a rogue). The Tawhiti Museum was an interesting extra. 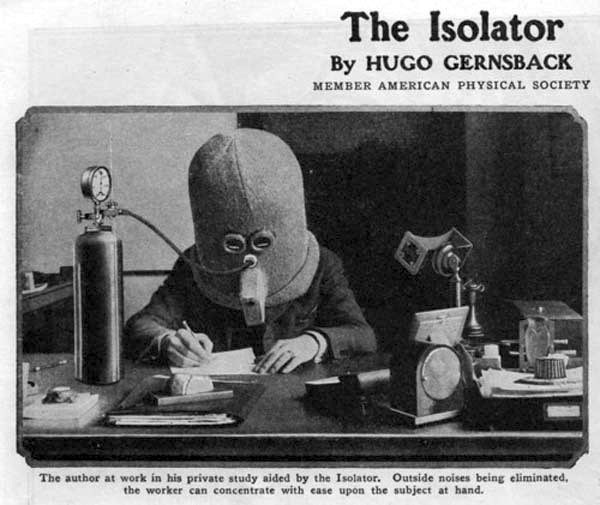 The author at work in his private study aided by the Isolator. Outside noises being eliminated, the worker can concentrate with ease upon the subject at hand. Noise-cancelling headphones - how far we have come.